Product prices and availability are accurate as of 2019-04-16 20:04:50 UTC and are subject to change. Any price and availability information displayed on http://www.amazon.com/ at the time of purchase will apply to the purchase of this product. 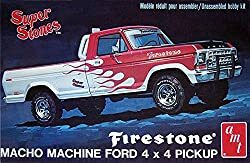 modelcars is proud to list this ERTL 1978 Ford 4x4 Firestone Pickup 1/25 Scale Model Kit by Ertl Models. 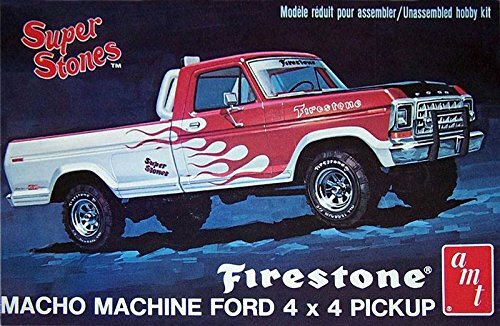 Gift this realistic ERTL 1978 Ford 4x4 Firestone Pickup 1/25 Scale Model Kit made by Ertl Models and listed by ModelCars.us. This interesting kit is currently ready to ship - buy securely and safely through us today. AMT858 1978 Ford 4x4 Firestone Pickup 1/25 Scale Model Kit AMT Tooling modifications have been made to backdate the kit and improve accuracy. Improvements include the re-engraving of door key holes, front fender reflectors and retooling of the correct front bumper. Features: Skill 2, paint and glue required. Off-road suspension, wheels and tires. Colorful decal sheet with Firestone graphics. Long-bed body style with authentic details. Scale: 1/25. Recommended Age: 10 and up. Warning: Choking Hazard! Small Parts not for children under 3.